Why are Purple Martins disappearing? Recently, there has been a sharp drop in the number of Purple Martins in Ontario and the reason behind this is not clear. Figuring out where they go to escape our cold winters will go a long way in helping us understand why their numbers are dropping. 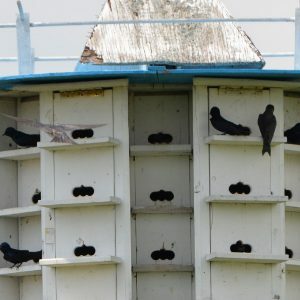 To start answering the question of why they’re disappearing, we started a project called the Purple Martin Project which is a collaboration between Nature Canada and York and Manitoba university scientists. Phase one of the project involved attaching tiny GPS trackers on Purple Martins in eastern Ontario. 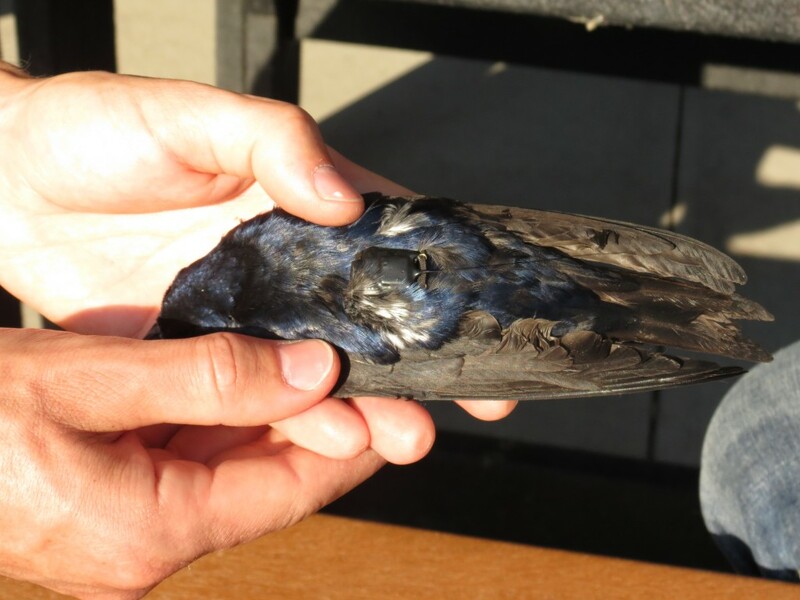 Just last week, scientists from Nature Canada and York and Manitoba Universities, caught Purple Martins, and with the greatest care, placed a small tracker on their backs, kind of like a backpack They were then released near their homes in man-made nests which resemble bird ‘condos’. The capture and release happened at the Nepean Sailing Club in Ottawa and on private properties on Amherst and Wolfe Islands, both located in Lake Ontario and a short distance from Kingston, Ontario. A Purple Martin with a GPS tracker attached to its back. We don’t know much about Purple Martins, but we do know that they over-winter in Brazil. But Brazil is a big country and there are many obstacles along the way to reaching the end of their migratory journey. From now until next spring, the tracking devices on each bird will collect vital information about where it went and how long it stayed in each location. Using this information, we can piece together a life story about these amazing birds and get one step closer to understanding why their numbers are declining. If we can pinpoint the reason(s) for their decline, then we can improve protection for them. Unfortunately, Purple Martins are not alone in experiencing population declines. They are part of larger group of birds called ‘aerial insectivores’ that have shown striking declines in recent decades. That’s troubling for bird watchers but also for whole ecosystems that needs just the right number of prey and predators to flourish. Purple Martins eat insects and help keep their population in check. Without them, entire forests would be quickly devoured by billions of hungry, leaf-eating insects. Purple Martins nest in man-made structures such as these ‘condos’ of gourds. 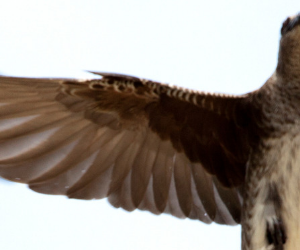 The plight of this enigmatic bird has caught the attention of media across the country. Their declining numbers coupled with our efforts to save them have captured the imaginations of local radio and TV shows, print and online newspapers from Ottawa to Calgary. With stories published in the Ottawa Citizen, Calgary Herald and others, we’re well on our way to achieving one of the important goals of the Purple Martin Project – educating people about the endangered species. CBC Radio’s All in a Day had Sarah Kirkpatrick-Wahl, Nature Canada’s Conservation Coordinator and Purple Martin Project participant, on its show to talk about the birds and what the project is all about. 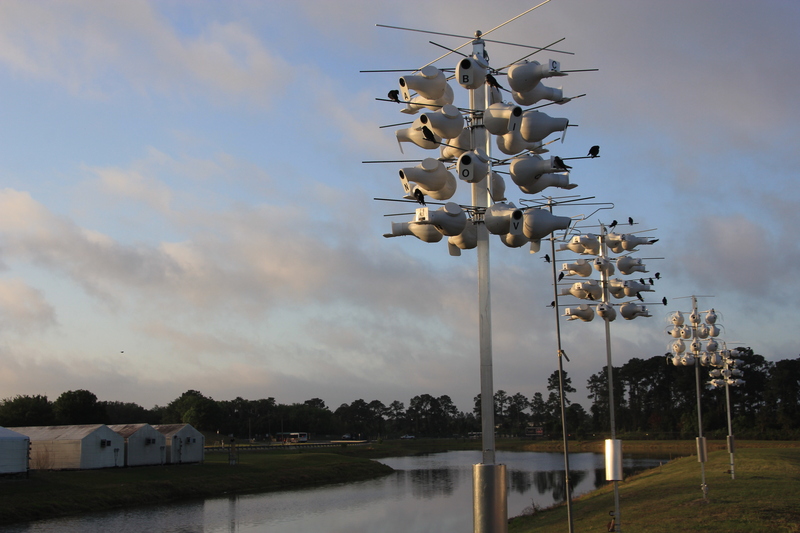 Find out more about the Purple Martin Project and how you can get involved.